Convicted of cultic type practices and sexual offenses. Jacob Frank was a Jewish merchant who claimed to be the messiah. His followers broke away from Judaism and created a new religion known as the Frankists, which was a quasi-Jewish, quasi-Christian religion. The development of the Frankists was made possible due to both the Jewish messianic movement of that era, which agitated the Jewish world after the appearance of Sabbatai Zevi, the pseudo-messiah from Smyrna, and which degenerated later into religious mysticism; and also the social and economic upheaval in the life of the Polish Jewry. The spread of Frank's messianic movement (1760-1770) occurred in the period following the killing of the Jews in the days of Bohdan Chmielnicki. Hundreds of ruined communities, in which almost every family mourned its martyred dead, awaited aid from Heaven. Some were inclined to see in the Ukraine massacres pre-Messianic sufferings, and in Sabbatai Zevi the promised messiah. Zevi's fall and subsequent conversion to Islam estranged him from most of his followers, but among the more uncultured portion of the Jewish people the belief in the mystic mission of Shabbetai Zevi persisted for a long time. Having lost its political significance, Messianism at the end of the seventeenth century assumed a mystical coloring, and the open popular movement was transformed into a secret sectarian cult. A half-Jewish, half-Islamic sect of Shabbetians was established in Turkey. In Poland, and particularly in Podolia and Galicia, there were formed numerous secret societies of Shabbethaians known among the people as "Shabbethai Zezviists," or "Shebs" (according to the Western pronunciation of "Shabbethai"). In expectation of the great Messianic revolution the members of these societies abandoned many Jewish principles of faith and discarded Jewish religious laws and custom. The mystical cult of the Shebs included both asceticism and sensuality: some did penance for their sins, subjected themselves to self-inflicted torture, and "mourned for Zion"; others disregarded the strict rules of chastity characteristic of Judaism, and at times gave themselves over to licentiousness. The Polish rabbis attempted to remove the "Shabbethaian heresy" at the assembly of Lemberg (1722) and elsewhere, but could not fully succeed, as it was kept alive mostly in secret circles which had something akin to a Masonic organization. The spread of mysticism was favored by the distressing social-economic condition of the Jews in Podolia and Galicia during the first half of the eighteenth century, when Poland was falling into decay, and the Haidamak movements destroyed security of person and property in many Jewish centers. The resulting decline of the rabbinical schools and of mental activity was on the whole favorable to the growth of mystical doctrines, which among the masses assumed at times the most monstrous forms. From among these secret circles of the Shabbethaians came the founder of the Frankist sect, Jacob Frank, born in Korolowka (Podolia) about 1726 as Jacob Leibowitz. His father was expelled from the community for belonging to the secret society of Tzeviists, and moved to Chernowitz,Wallachia in 1730, where the influence of the Turkish Shabbetaians was strongly felt. While still a boy at school Frank displayed an aversion to Jewish learning founded on the Talmud, and afterward often styled himself "a plain man" or "an untutored man." In the capacity of a traveling merchant of clothes and precious stones he often entered Turkey; there he was named "Frank," a name generally given in the East to a European; and there he lived in the centers of contemporary Shabbethaianism; Salonica and Smyrna. In the beginning of the fifth decade of the eighteenth century he became intimate with the leaders of the sect and adopted its semi-Islamic cult. Two Shabbethaians, followers of Osman Baba wewre witnesses to his wedding in 1752. In 1755 he appeared in Podolia, and, gathering about him a group of local sectarians, began to preach to them the revelations which were communicated to him by the successors of the false messiah in Salonica. In their secret gatherings was performed, under the leadership of Frank, much that was directly opposed to the religious-ethical conceptions of the orthodox Jews. One of these gatherings in Landskron ending in a scandal, the attention of the rabbis was drawn to the new propaganda. As a foreigner, Frank was obliged to leave Podolia, while his followers were given over to the rabbis and the local authorities (1756). At the rabbinical court held in the village of Satanov many of the sectarians confessed to having broken the fundamental laws of morality; and women confessed to having violated their marriage vows, and told of the sexual looseness which reigned in the sect under the guise of mystical symbolism. As a result of these disclosures the congress of rabbis in Brody proclaimed a strong herem (Hebrew for ex-communication) against all impenitent heretics, and made it obligatory upon every pious Jew to search them out and expose them. The persecuted sectarians informed Dembrowsky, the Catholic Bishop of Kamenetz-Podolsk, that the Jewish sect to which they belonged rejected the Talmud and recognized only the sacred book of Kabbalah, the Zohar, which they alleged admitted the truth of the Christian doctrine of the Trinity. They claimed that they regarded the Messiah-Deliverer as one of the three divinities, but they failed to state that by "messiah" they specifically meant Shabbetai Tzvi. The bishop took seriously the "Anti-Talmudists," or "Zoharists," as the sectarians began to style themselves, and in 1757 arranged a religious discussion between them and Jewish rabbis. The Anti-Talmudists presented their theses, to which the rabbis gave a very lukewarm and unwilling reply for fear of offending the Church dignitaries who were present. The bishop decided that the Talmudists had been vanquished, and ordered them to pay a fine to their opponents, and to burn all copies of the Talmud in the bishopric of Podolia. After the death of their patron, the bishop, (9 November) the sectarians were subjected to severe persecution by the rabbis and the heads of the community. The Anti-Talmudists succeeded in obtaining from Augustus III of Poland, (1733-1763) an edict guaranteeing them safety; but even this did not avail to free them from the unfortunate position of men who, having parted from their coreligionists, had not yet succeeded in identifying themselves with another faith. At this critical moment Jacob Frank came to Iwania (Podolia) with a new project; he posed as a direct successor of Shabbethai Zevi and Osman Baba, and assured his adherents that he had received revelations from Heaven. These revelations called for the conversion of Frank and his followers to the Christian religion, which was to be a visible transition stage to the future "Messianic religion." In 1759, negotiations looking toward the conversion of the Frankists to Catholicism were being actively carried on with the higher representatives of the Polish Church; at the same time the Frankists tried to secure another discussion with the rabbis. The Polish primate Lubenski and the papal nuncio Nicholas Serra were suspicious of the aspirations of the Frankists, but at the instance of the administrator of the bishopric of Lemberg, the canon Mikulski, the discussion was arranged. It was held in Lemberg, and was presided over by Mikulski. Protestant missionaries even tried to detour the Frankists to Reformation. This time the rabbis energetically repulsed their opponents. After the discussion the Frankists were requested to demonstrate in practise their adherence to Christianity (1759); Jacob Frank, who had then arrived in Lemberg, encouraged his followers to take the decisive step. The baptism of the Frankists was celebrated with great solemnity in the churches of Lwów, members of the Polish szlachta acting as god-parents. The neophytes adopted the names of their godfathers and godmothers, and ultimately joined the ranks of the Polish nobility. In the course of one year more than 500 persons were converted to Christianity in Lwów, among them the intimates and the disciples of Frank. Frank himself was baptized in Lwów (17 September of 1759) and again in Warsaw, Augustus III acting as godfather (18 November). The baptismal name of Frank was "Joseph" (Józef). The insincerity of the Frankists soon became apparent, however, for they continued to intermarry only among themselves, and held Frank in reverence, calling him "the holy master"; and it was also discovered that Frank endeavored to pass as a Muslim in Turkey. He was therefore arrested in Warsaw (6 February of 1760) and delivered to the Church's tribunal on the charge of feigned conversion to Catholicism and the spreading of a pernicious heresy. The Church tribunal convicted Frank as a teacher of heresy, and imprisoned him in the monastery in the fortress of Czestochowa, so that he might not communicate with his adherents. Frank's imprisonment lasted thirteen years, yet it only tended to increase his influence with the sect by surrounding him with the aura of martyrdom. Many of the Frankists established themselves near Czestochowa, and kept up constant communication with the "holy master," often gaining access to the fortress. Frank inspired his followers by mystical speeches and epistles, in which he stated that salvation could be gained only through the "religion of Edom," or "dat" (Hebrew, law", by which was meant a strange mixture of Christian and Shabbethaian beliefs. After the first partition of Poland Frank was released from captivity by the Russian general Bibikov, who had occupied Czestochowa (August of 1772). Until 1786 Frank lived in the Moravian town of Brno, and was surrounded by a numerous suite of sectarians and "pilgrims" who came from Poland. For many of the pilgrims there was great attraction in the person of Eve, the beautiful daughter of Frank, who at this time began to play an important role in the organization of the sect. In his "court" of Brno, he held an army of 600 people, partly from the Cossack Jews of general Potemkin. Future zar Paul I of Russia visits him. Accompanied by his daughter, Frank repeatedly traveled to Vienna, and succeeded in gaining the favor of the court. The pious Maria Theresa regarded him as a disseminator of Christianity among the Jews, and it is even said that Joseph II was favorably inclined to the young Eve Frank. Ultimately the sectarian plans of Frank were found out here also; he was obliged to leave Austria, and moved with his daughter and his suite to Offenbach, a small German town. Here he assumed the title of "Baron of Offenbach," and lived as a wealthy nobleman, receiving money from his Polish and Moravian adherents, who made frequent pilgrimages to Offenbach. On the death of Frank (1791) Eve became the "holy mistress" and the leader of the sect. As time went on the number of pilgrims and the supply of money constantly diminished, while Eve continued to live in her accustomed luxury. She finally became involved in debt, and died neglected in 1816. 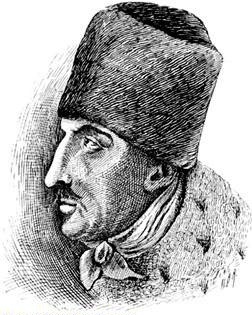 Frankist agents acted in times of French Revolution, like Moses Dobruchka who entered the Jacobines as Junius Frey and ascended to the top of Freemasonry. Many of the Frankist saw Napoleon Bonaparte as a potential Messiah. The Frankists scattered in Poland and Bohemia were gradually transformed from feigned to real Catholics. Their descendants merged into the surrounding Christian population. The sect disappeared without leaving any traces in Judaism, they become the source of Polish gentry of Jewish origins. Rabbi Zvi Hirsh was the chief Rabbi in Horodenka at that time. Later he was also the chief Rabbi in Jazlowicze and Zalesczyki. These two towns were part of the Poniatovski estate. Hirsh's son, Rabbi Meir Margaliot, took over the Rabbinate after his death. He is the author ofMeir Netivim (The Light of the Ways). He became the son-in-law of the famous Rabbi Itzik – also known as "Rabbi Itzik of Horodenka." God bestows his wisdom to the wise men. With each generation, in every nation and state and with every language, God seeks man's wisdom and truth – the complete truth of mankind. The knowledgeable Prince Radziwill, who studied in depth all the religions of the world, did not find a single religion as truthful and filled with Godliness as the religion of the king Messiah Shabbetai-Zevi. Therefore he aligned himself with us to fight in the name of our truthful Messiah. His advisors requested that we enlighten those blind Jews of Horodenka, who are dwelling in the shadow of death, by teaching them the religious wisdom of Shabbetai Ben-Zevi. His teachings will heal those with broken hearts and will free those imprisoned by the web of other religions. The prince wants to have those people, Jews and Gentiles alike, live on his estate where they will be protected and safe and will lack nothing. I have been traveling from place to place to preach Shabbetai's wisdom and seek those who believe in him. I have been wandering until I came to this town and met the writer Mr. Weiler to whom I told the reason of my visit.